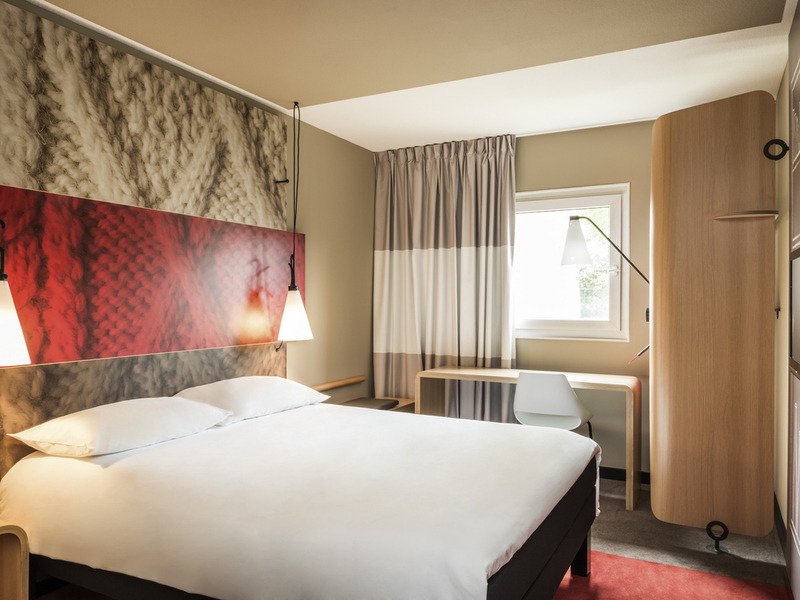 The ibis Caen Porte de Bretagne welcomes you to a renovated, quiet and conveniently located hotel. Easy access thanks to its proximity to the main roads. Located in Bretteville-sur-Odon, the ibis Caen Porte de Bretagne hotel is easily accessible from the A13 and A84 highways, and is just 10 mins from Caen city center, 5 mins from Caen Carpiquet airport and 5 mins from Festyland theme park. The hotel has 80 air-conditioned rooms, 3 of which are adapted for guests with reduced mobility, a 24-hour bar with terrace, free secure car park for cars and buses and Courtepaille restaurant. Free WIFI access throughout the hotel. The hotel is 5 mins from the center of Caen and from the Peace Memorial. Landing beaches. For authentic taste. A choice of more than 20 different meats cooked. On an open grill right in front of you. It's been a dining favourite for more than 40 years. Excessive alcohol consumption is dangerous to your health, drink in moderation. Room very clean & comfortable . Reception staff very friendly & helpful. Great location for connecting to motorway. Convenient ‘Courte Paille’ restaurant adjacent to hotel for evening meal & a pleasant well run breakfast next morning. Have stayed several times now on our way south, will definitely stay again. I have stayed a number of times here but for the first time the toilet in my room was dirty and not properly cleaned; no hot water in the shower in the morning. So my latest stay was disappointing. Dear A, Thank you for taking the time to tell us about your experience at the ibis Caen Porte de Bretagne. We are sincerely sorry for your disapointment regarding your latest experience in our hotel, be sure it won't happen ever again. We would be glad to recover your trust if you decide to come back and visit us :) Best regards, Thomas Laurière, Desk clerk. Dear Mr, We very much appreciate your comments regarding your stay at Ibis Caen Porte de Bretagne. Be sure we would warmly welcome you next time you visit us :) Best regards, Thomas Laurière, Desk clerk. As previous we have always found the hotel very good, however on our last stay our Room no: 103, which was adjacent to the lift, was affected by lift usage I.e mechanical noise transmitted into the room by the lift. On arrival we were informed that there was no hot water & the plumber was dealing with it. We were informed when it was reinstated, but was off again in the morning when we needed it. Dear Mister d., We very much appreciate your comments regarding your stay at Ibis Caen Porte de Bretagne. We are glad you enjoyed your time here and hope to see you soon in Normandy :) Best regards, Thomas Laurière, Desk clerk. Bonjour Monsieur L., Nous vous remercions pour votre commentaire suite à votre séjour à Ibis Caen Porte de Bretagne. Ravis que notre établissement vous ait plu, nous veillerons à avoir plus de présence d'ici à votre prochaine visite :) Bien cordialement, Thomas Laurière Réceptionniste. Helpful reception staff and great breakfast. A very modern, comfortable hotel. Good variety breakfast. A welcome refuge after a tiring day. This Ibis is very reliable with it’s friendliness and cleanliness. The beds are very comfortable and it is easy to relax after a busy day and a very late arrival. My only problem is that there is not a lot of ‘low fat’ things for breakfast, eg yogurt. The receptionist was friendly but took almost 1 hour to get us some tea. No tea making facilities in the room, this is not acceptable. Breakfast was OK but unremarkable. The room was comfortable and quiet. Ok, but a bit disappointing. Comfortable but the cleanliness of the bathroom was not as expected. We stay at Ibis hotels because the beds are generally very comfortable which, when you’re traveling, is important. But the bathroom had not been given the attention required, the toilet itself was ..less than adequately cleaned. One night with a group of approx 20 people who were there for a car rally. Functional, clean and confortable room. We stayed for one night as a stop over on the way to the Dordogne. We were in the hotel about 12 hours so it was a very short stay. Dear PAUL j., We very much appreciate your comment regarding your stay at the Ibis Caen Porte de Bretagne. We are pleased you enjoyed your stay in our hotel and we do hope you had a safe way to Dordogne as well, Be sure we would gladly welcome you again next time you come across Normandy :) Best regards, Thomas Laurière, Desk clerk. Dear Tony Q, We very much appreciate your comments regarding your stay at the Ibis Caen Porte de Bretagne. We are glad you enjoyed your stay in our hotel, Do not hesitate to ask for hot water directly to the front desk, we are used to serve some drinks, but we can't do much for the bath as our rooms are strictly set with showers. We hope to see you next time you travel through Normandy :) Best regards, Thomas Laurière. Desk clerk. As a family of 5 we normally have to be in 2 completely separate rooms. Here we had 3 singles in a connecting room to ours which was perfect. The beds were very comfy too. Breakfast was excellent and good value at around €35 for all 5 of us. Rooms were as requested and clean. Staff were pleasant and helpful. One disappointment is that the machine did not dispense decaffeinated coffee at breakfast time. Would like to see this introduced in all Ibis establishments. Good size room and excellent clean shower room. Two chairs would be an improvement rather than one.